The Ancient Order of Hibernians is a Catholic, Irish American Fraternal Organization founded in New York City on May 4,1836 . The Order can trace its roots back to a parent organization, of the same name, which has existed in Ireland for over 300 years. However, while the organizations share a common thread, the North American A.O.H. is a separate and much larger organization. The Order evolved from a need in the early sixteen hundreds to protect the lives of priests who risked immediate death to keep the Catholic Faith alive in occupied Ireland after the reign of England's King Henry VIII. When England Implemented its dreaded Penal Laws in Ireland, various secret social societies were formed across the country. These groups worked to aid and comfort the people by whatever means available. Similarly, the Ancient Order of Hibernians in America was founded May 4th, 1836 at New York's St. James Church, to protect the clergy, and church property from the "Know Nothings" and their followers. At the same time the vast influx of Irish Immigrants fleeing famine issues in Ireland in the late 1840's , prompted a growth of various social societies in the USA - the largest of which was, and continues to be, the Ancient Order of Hibernians. Active across the United States, The Order seeks to aid the newly arrived Irish, both socially, politically. The many Divisions and club facilities located throughout the U.S. traditionally have been among the first to welcome new Irish Americans. Here, the Irish culture -- art, dance, music, and sports are fostered and preserved. The newcomers can meet some of "their own" and are introduced to the social atmosphere of the Irish-American community. 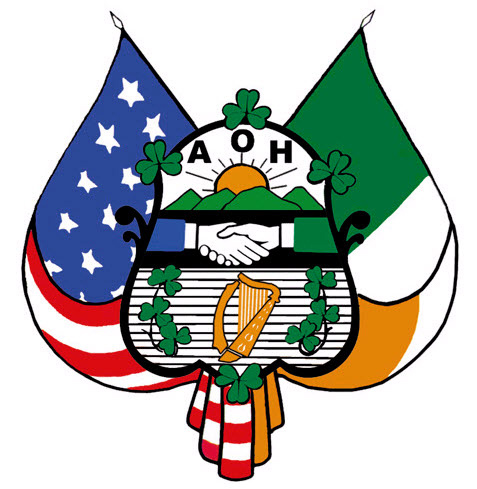 The AOH has been at the political forefront for issues concerning the Irish, such as; Immigration Reform; economic Incentives both here and in Ireland; the human rights issues addressed in the MacBride Legislation; Right-To-Life; and a peaceful and just solution to the issues that divide Ireland. The Order has also provided a continuing bridge with Ireland for those who are generations removed from our country. The AOH sponsors many of the programs associated with promoting our Irish Heritage such as the IRISH WAY PROGRAM. You may further seek admittance to the FINEST Irish Catholic Organization in the World -- all we would ask is for you to live our motto of: "Friendship, Unity, and Christian Charity". Dia 's Muire dhuit !